Kiwifruit is perhaps one of the most unique fruits. With its brown fuzzy skin, and bright green meat, there isn't another comparable fruit. Kiwi is native to China, where it was consumed for thousands of years. In the early twentieth century, missionaries brought kiwi trees to New Zealand from China. Before its introduction to the United States, kiwifruit was known as Chinese gooseberries. However, upon its appearance in the U.S. it was named kiwi in honor of the native bird of New Zealand. Kiwifruit is especially rich in vitamin C.
It is also a good source of dietary fiber, and the minerals potassium, magnesium, copper, and phosphorous. 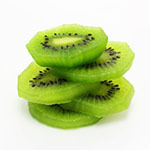 Kiwi also contains the antioxidants vitamins E and C.
A 3 1/2 ounce serving of kiwi contains a mere 61 calories. Similar to other vitamin C-rich foods, kiwis are beneficial for respiratory tract health. Kiwis can help prevent respiratory issues such as wheezing, shortness of breath and coughing. Kiwis are excellent when paired with most fruits, but taste especially good when served with banana, strawberry, grapes, apples, and oranges. Try adding kiwi on top of yogurt for a healthy and light snack. Tossing kiwis in with a salad, is a fun and easy mix up to a typical dish. What is your favorite way to enjoy kiwifruit?